On October 4, 1957, an intercontinental ballistic missile was launched from the steppes of Kazakhstan in the former Soviet Union. It did not carry a weapon, but nonetheless it sent a shockwave across the United States. 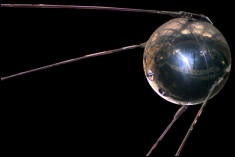 In less than two hours after lift-off, a 23-inch, 184-pound steel sphere called Sputnik (translated as ?traveling companion of the Earth?) passed through the skies over the launch site, confirming that a man-made moon was now orbiting the Earth at approximately 17,000 miles per hour. The Space Age had begun. As news of the Soviet accomplishment quickly spread by radio and television, untold millions climbed onto rooftops, ventured into city parks, or ambled out to dark backyards, all scanning the heavens for a glimpse of a rapidly moving star. Shortwave radio operators picked up a persistent ?beep ? beep ? beep? signal broadcast from the satellite as it passed overhead.